Fogler Library Technical Services staff is available at your convenience, to provide in-person training and phone support to faculty, staff, and students engaged in self-archiving. Contact kimberly.sawtelle@maine.edu or call 207.581.1692 to schedule a training opportunity. Group and one-on-one training sessions are available. Graduate and undergraduate students are welcome to submit approved original research papers, poster presentations, and other scholarly and creative work to DigitalCommons@UMaine. Student work must be accompanied by an authorization form signed by a faculty advisor for each work being submitted to the repository. Learn more about submitting student work. Directions to upload Student Work. The following provides step-by-step instructions for entering metadata and uploading a document in Digital Commons. Please visit the Manage Content page for more advanced editing procedures and steps to manage submissions. From your "My Account" page (illustrated above), select the "Upload" link. DigitalCommons@UMaine requests standard bibliographic data be entered into the fields provided (required data fields are flagged with red type). DOCUMENT TYPE: Select the appropriate document type from the drop-down menu. AUTHORS: Enter the author's name. Click the green plus sign (+) to add extra lines for multiple authors. To edit an entry, click the pencil icon. To delete an entry, click the red (x) icon. 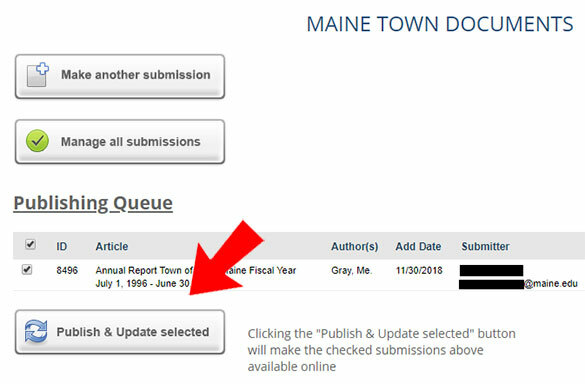 For UMaine authors and current staff members, enter a valid maine.edu address. This step allows for delivery of monthly download statistics. EDITION: For a book or monograph, enter the edition of the work. EDITOR: Enter the name(s) for up to three editors, as appropriate. PUBLICATION TITLE: For published articles and book chapters, enter the title of the publication in which the work appears. 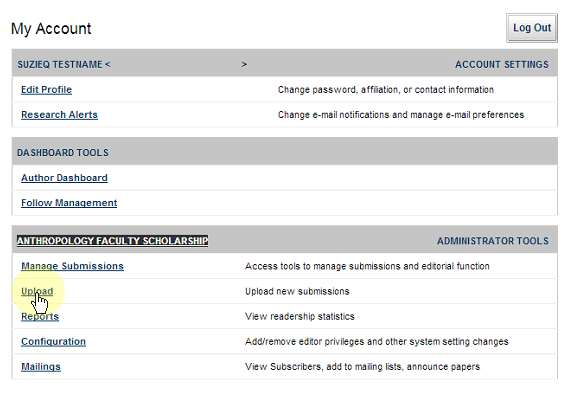 PUBLISHER: Enter the publisher name for journals, books, and/or software. RIGHTS AND ACCESS NOTE: Enter publisher or author copyright statement using the copyright symbol (©) followed by the date of copyright and other pertinent information. Copy and paste notes are available under the Rights Statements page of this LibGuide. PUBLICATION DATE: Enter the publication date. PUBLISHER LOCATION: Enter the publisher's location. RIGHTS STATEMENT: Select the appropriate rights statement to communicate the copyright and reuse status of the digital object you are uploading. For additional explanation, please visit the Rights Statements page of this LibGuide. LANGUAGE: If the work is not published in English, enter the language of publication. FIRST PAGE: Enter the first and last page numbers for articles and book chapters. LAST PAGE: Enter the issue, publication, and volume numbers for journals in which published articles originally appeared. ISSUE NUMBER: Enter the issue number from the original citation. PUBLICATION NUMBER: Enter the article number, as appropriate. VOLUME NUMBER: Enter the volume number from the original citation. PLACE OF CONFERENCE: For conference proceedings, enter the location the conference was held as well as the sponsor. CONFERENCE SPONSOR: Enter list of conference sponsors separated by commas. SOFTWARE VERSION: For software, provide the version number. EMBARGO PERIOD: Enter the embargo period (if any) for published articles. No embargo period: if the publisher's embargo period has already expired. 6 months, 1 year, 18 months, 2 years, or 3 years, depending on publisher stipulations in the author copyright agreement. Digital Commons will automatically release the article from the date of upload. DISCIPLINES: Select appropriate disciplines from the list provided. (Disciplines Taxonomy). COMMENTS: Enter additional comments, as appropriate, including such things as funding sources, acknowledgements, etc. REPOSITORY CITATION: Enter a Repository Citation if you wish to override the MLA citation automatically generated by DigitalCommons@UMaine. CITATION/PUBLISHER ATTRIBUTION: Enter the original publisher citation. VERSION: Select the appropriate version of the work: pre-print (aka the author’s accepted manuscript), post-print (aka final draft of author's manuscript post-refereeing), publisher's version, or other. CREATIVE COMMONS: If appropriate, indicate any Creative Commons License. PEER REVIEWED: Check peer-reviewed, as appropriate. UPLOAD FILE: Upload the file. STREAMING MEDIA: If the work is streaming media, provide a link out to the video. PUBLICATION STATUS: If the work was previously published, select the appropriate response. ADDITIONAL FILES: Attach any additional files associated with the work (such as spreadsheets or photographs). Follow directions provided in pop-up window. SUBMIT: Click submit to ingest content and queue for publication. Click cancel to cancel the upload. The last step in the process of making content available to the public in Digital Commons is to publish. Review metadata in the Confirmation Page view. If changes are required, click the EDIT SUBMISSION button. This option is available only following the initial submission of content. When you are done uploading content, check the tick box next to each title ready for publication. Click the PUBLISH & UPDATE SELECTED button only once to avoid duplication of files. Congratulations! You have successfully submitted and published the public view in Digital Commons. Allow 20-30 minutes for papers to become visible in the public interface. New content may not be indexed until the following day.